Steve Woods | Northampton or Novosibirsk? Via Twitter, the following image arrived in my timeline this morning. 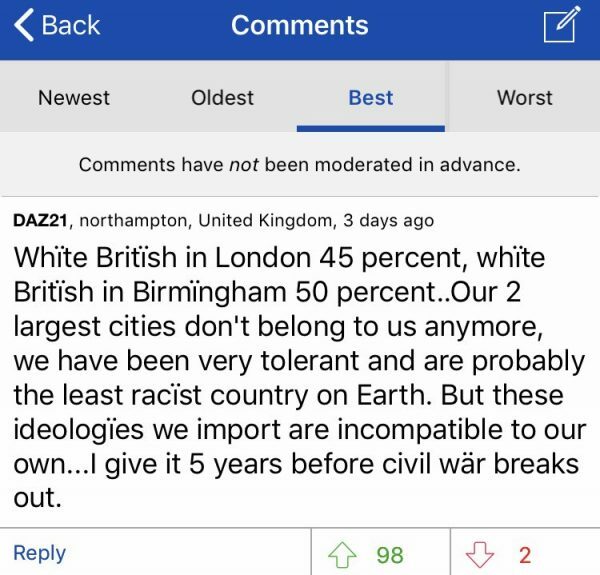 It’s a below the piece comment, ostensibly from someone called DAZ21, from the mobile version of the Daily Mail website. As you can see, at the top of the comment DAZ21 would like us all to think he’s from the fair English county town of Northampton. However, there are a couple of problems with locating dear ole DAZ21 there if one examines the text of the comment closely; and the vowels in particular. Look first near the bottom of the comment. Is that a letter “a” with diaresis (ä), I see before me? The letter “a” with diaresis is quite common in German (as in Käse – cheese. Ed. ), but not in English. However, there’s a real clincher in the text that shows DAZ21 is more likely to hail from Novosibirsk than Northampton: and once again it’s a vowel that gives the game away, namely the “i” with diaresis “ï“). According to Wikipedia, “Yi (Ї ї; italics: Ї ї) is a letter appearing the Cyrillic script, as used by Russian, amongst other languages. In English this is a very uncommon character and is used when ⟨i⟩ follows another vowel and indicates hiatus (diaeresis) in the pronunciation of such a word. There have been questions about the reliability of the the Daily Mail for decades. Last year it was banned as a source by Wikipedia due to its “reputation for poor fact checking and sensationalism“. One wonders how much further that reputation has slumped if its below the piece comments are now full of bots or actual Russians pretending to be Brits posting provocative and/or misleading content. By the way, Novosibirsk is Russia’s third most populous city after Moscow and St Petersburg. This entry was posted by Steve Woods on January 27, 2019 at 10:17, and is filed under Language, Media, Social Media. Follow any responses to this post through RSS 2.0. Both comments and pings are currently closed.